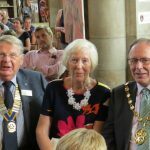 Last Tuesday the annual Warwick Rotary Midsummer Concert was held in St Mary’s Church, Warwick. President John Taylor welcomed Warwick District Council Chairman Cllr Alan Boad, and members of the Warwick Court Leet, as the church filled with some 200 children from 8 schools and their parents. Warwick School Lower strings started the proceedings with a lively Polonaise, followed by Aylesford school choir singing “May it Be” by Enya from Lord of the Rings, and the Beatles “All you need is Love”. Children from Ridgeway Special school- the “Ridgeway Rockers” gave a spirited performance of “I’m Singing” and “I Believe” which the audience clearly enjoyed. 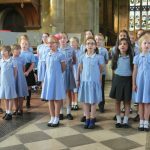 “Emscote Voices” from Emscote Infants and All Saints Juniors have performed at the Genting Arena, Royal Albert Hall, and Warwick Castle this year which has clearly boosted their confidence, and they gave an enthusiastic performance of the Military Wives song “Stronger Together”, and “Rule the World”. Newburgh Orchestra and choir entertained everyone with 3 traditional songs finishing with “Give me Oil in my lamp”. Westgate School enjoyed singing “When I grow up” from Matilda, and then an Elizabethan round. Youngsters from Woodloes Warblers danced along to “Oh I do like to be beside the seaside”. Warwickshire Central Area Music Theatre Group provided a very slick finale with excerpts from recent productions Matilda, and Joseph and the Amazing Technicolour Dreamcoat and sent everyone singing on their way. President John Taylor thanked teachers, parents and all the children for putting on such a talented concert and particularly Trevor Jones of the Warwickshire Music. All proceeds from the school’s concerts go to supporting music in local schools. Over the last 6 years the club has been able to allocate around £8,000 to schools to purchase musical equipment, provide tuition and assist choirs to travel to competitions.